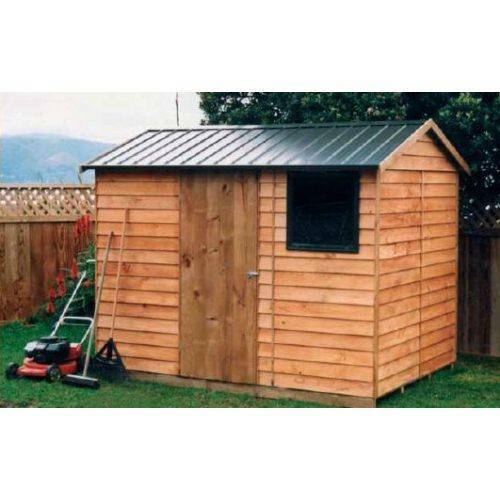 The Garden Shed Company sells garden sheds. Nothing too surprising about that. But how did we come to be selling kitset sheds online? More to the point, why should you buy from us? The idea to sell garden sheds began, in typical Kiwi fashion, while standing around a bonfire at a birthday party in Awakeri. Conversation had turned to how one of the guests had been shopping for a shed, only to find the stores full of imported sheds of questionable quality. These seemed to be made out of “tin so thin you could probably poke a finger through it” (their words, not ours). Another person mentioned how the last one they bought nearly cost him his sanity trying to assemble it. So it got me thinking. It seemed the cheap garden sheds were just that – cheap. Plus the time spent making sense of the instructions and erecting the shed is enough to make a sane person mad (not to mention the lost skin). So if every back yard needs a shed, there must be a lot of people looking for an affordable model that is easy to assemble and of great quality. These people are all around NZ meaning the only way to reach them is on the web. But who buys sheds over the internet when every local hardware shop has them sitting on a shelf ready to pick up? People like my 2 friends, and hundreds more who are looking for something better. So I went in search of the perfect storage shed. It had to be easy to assemble, durable, affordable and able to be sent anywhere in the country. After comparing more sheds than we care to think, about we found a manufacturer right here in NZ that ticked all the boxes. And that’s how a Tauranga business came to sell Garden Master and Galvo sheds to all corners of New Zealand. We have since expanded our range to include pine and PVC models, raised garden beds and more. Direct Selling: We order direct from the manufacturer. Less handling saves you money! Direct Shipping: Your order is delivered straight to you from the factory. Again, less handling…. Competitive Freight Deal: You pay no more whether you live in Wellington, or Whangarei, Nelson or Invercargill. Low Overheads: No flash shops, big rents, or dozens of “team members” to pay for. Kiwi Made Products: Because we sell NZ made (except Duramax sheds) products, replacement parts are always available. Customer Convenience: No driving to a store, no trailers to hire, no hassle. And one last thing. If you think your service may not be as good because you are “dealing with a computer”, don’t worry. We are real people who work real hard to provide great customer service, prompt delivery, value for money and quality goods. You can phone and speak to a real person anytime if you wish.